What the Hell Is THC, Anyway? You've probably heard this three-letter combo come up in weed conversations before, but apart from its ability to induce the munchies and turn Stacy Keach into a lizard, how much do you really know about THC? We hit the books and consulted noted dispensary owner and cannabis advocate "Dr." Dina Browner to get the lowdown on this high-inducing chemical compound. So, really... what is THC? What does it stand for? THC (or Delta-9-Tetrahydrocannabinol, if you like long words) is the primary psychoactive compound found in cannabis, responsible for most of the effects you feel when you smoke, dab, or otherwise consume it. Although every part of the cannabis plant contains THC, the highest concentration is found within the trichomes: those tiny, dew-looking sprouts that cover the plant's surface and give high-quality bud its "frosty" appearance. 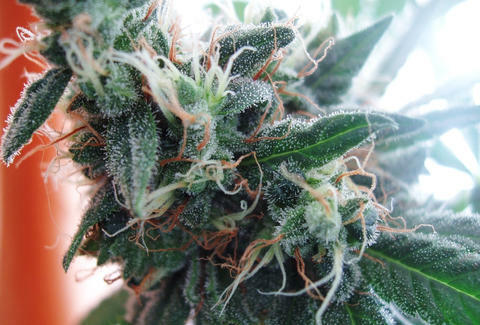 Thought to have developed as a defense against pests and grazing animals, the THC content of these trichomes can vary depending on when the plant is harvested. The trichomes are clear when THC production is still in its early stages, but as time goes on they become cloudier and finally take on an amber hue once the THC content reaches its peak. Growers typically begin their harvest when there's a 50/50 split between cloudy and amber, although this obviously varies by the individual (as well as the strain). How much THC is there in pot? 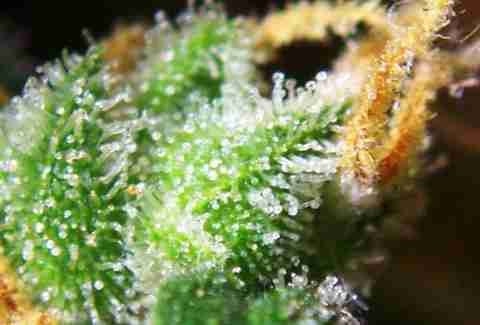 Just as harvest time depends on the individual strain as well as the individual growing it, so too does THC content. As Browner puts it, "normally when you grow cannabis, you can maybe get your percentage of THC to be between 15 and 27%. If you're at 27%, you're a rockstar." This is only true for standard, cured marijuana, though. If you look at cannabis in its concentrated form, you'll find a product that's far more potent, containing anywhere from 50 to 95% THC. 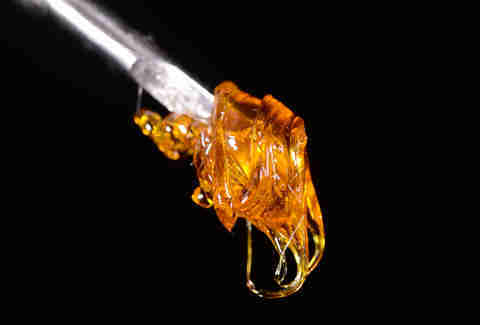 This purer category includes all the waxes, shatters, and oils used for dabbing, a method of consumption that's explained at greater length right here. How does it get you high? In order to induce its sought-after effects, THC acts on the brain's cannabinoid receptors to trigger the release of dopamine and norepinephrine, which in turn produce feelings ranging from euphoria and relaxation to paranoia and enhanced physical sensations. Like you'd expect, the intensity of the effects depends on both the dosage and the individual taking it: 5,000mg of THC might be completely overwhelming for a first-timer, but totally normal to an experienced dabber. Of course, it's not all sunshine and sinsemilla, and there's a difference between a runner's high and a dabber's high. THC's been linked to bouts of psychosis in some users, although it's extremely rare and usually seen in individuals who had an underlying mental condition in the first place. It remains to be seen whether there's a direct correlation between cannabis use and schizophrenia, or whether it's simply that more mentally ill people are smoking higher-strength weed, since overall marijuana use and potency are continually increasing. Ultimately, though, most heavy pot users would agree that mild psychosis (a temporary loss of contact with reality) is kinda the whole point.